ALERT: Section 179 Increased to $1,000,000 for 2018! Essentially, Section 179 of the IRS tax code allows businesses to deduct the full purchase price of qualifying equipment during the tax year. That means that if you buy a piece of qualifying Kentucky Gauge equipment, you can deduct the FULL PURCHASE PRICE from your gross income. In years past, when your business purchased qualifying equipment, it typically wrote it off a little at a time through depreciation. For example, if your company spends $50,000 on a machine, it gets to write off $10,000 a year for five years. Now, while it’s true that this is better than no write-off at all, most business owners would really prefer to write off the entire equipment purchase price for the year they buy it. And that’s exactly what Section 179 does – it allows your business to write off the entire purchase price of qualifying equipment for the current tax year. Use Section 179 to purchase much-needed equipment right now! Why wait?! Let's say you purchase a piece of equipment for $20,000. 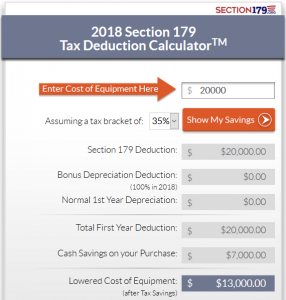 If you're in the 35% tax bracket, the true equipment cost is only $13,000 after the Section 179 tax deduction. That's a savings of $7,000! That's an extra $7,000 in your pocket just for purchasing equipment that you need in order to stay competitive and meet production goals. Try it our for yourself. Do you already have a quote from one of our sales representatives? Check out the Section 179 calculator to see how much you can save. In order to qualify for the Section 179 Deduction, the equipment must be purchased, financed or leased equipment and put into service by December 31 of this year. Manufacturing is getting more and more competitive. In order to stay profitable, you need to figure out how to cut costs, reduce rework, eliminate scrap, improve your quality control, and increase throughput. Kentucky Gauge is the answer. Check out our brand new Kentucky Gauge website to view our full product offering and find out how we can help you stay ahead of your competitors. Kentucky Gauge is your competitive advantage!